Are you looking for information on the company Jinan Kaima Machinery Manufacturing Co Ltd located in China who sells Horse Floats? If so, read below to read one buyer’s experience with this company. 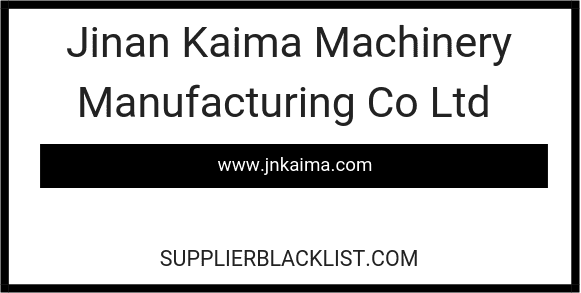 Also you will find related search links to explore more about Jinan Kaima Machinery Manufacturing Co Ltd on Supplier Blacklist and across the web. This robbery is well organized, as there is a transport company as 3rd party. We placed order : Jan.14 2019, sign Sales contract on Jan. 15-(I am stupid to send them the model-just need to be signed—??! !& 1st payment, then Fake transport Jan. 23 Then 2nd Payment. when put us out of us, we ask a friend speaking English and their English is so poor. So I finally understood that all was a big scam. Need More Info on Jinan Kaima Machinery Manufacturing Co Ltd? If you need more information, you can click the below links to search for more submissions about Jinan Kaima Machinery Manufacturing Co Ltd on Supplier Blacklist as well as go to the search results page on Google for more reviews online about this company.